Lambert Academic Publishing, Saarbrücken, 2017, 249 p.
CHAPTER I - The Names of the Nothing. Every discourse about the Nothing seems fully and ultimately empty. However, this cannot be true precisely because it is language – that is, discourse – which always brings forth the Nothing, the word of the “Nothing”. The language therefore speaks about the Nothing and perhaps also “speaks Nothing”. In its primary – and abstract – appearance, the Nothing is precisely “that” “which” it is not. However, its word is still there in the words of most languages (for we cannot know all). What is more, since it is not, at a first sight all the Nothing has is its word, its name... and this is precisely what protrudes. But the word of the Nothing utters in language only that which has no being. That is therefore not just any kind of negation, but the negation of being, the name of the negation of being. The “Nothing” is therefore the mere word of the negation of being. Which lives standing in languages. As deeply that its translation presents no problems. The German ­­das Nichts can be translated unproblematically to the English Nothing, the French rien or néant, the Slavic nić, the Romanian nimic or the Hungarian semmi, etc. However, if we go on deeper into the problem, it shows that, despite the unproblematic translation, being and (its) negation articulates in different ways in the names of the Nothing. The writing analyses this in detail, with special emphasis of the Hungarian word of Nothing [Semmi]. It concludes by initiating a philosophical dialogue with a poem of Attila József. - B) A (Possible) Forum for Freedom: Faculty of Philosophy, Chair Philosophy and Applied Philosophy - A Lecture on Philosophy Without Thinker. The inquiry analyzes the process and consequences of the merging of philosophy and the University, the Faculty of Philosophy, proving its long-distance effects on the basic tendencies of modes of philosophizing. This means that philosophy as a profession became the dominant form of philosophizing, “going on” in various university departments and research institutions mostly without any kind of existential weight. This is what this paper calls a “thinker-deprived philosophy” or “philosophizing”, recalling at the same time the dangers of the Bologna-process in this matter. CHAPTER III - The Sacred, Or the Bright Sounds of Silence – A thinking-experiment on nature, related (and created) to Heidegger and Hölderlin. This philosophical experiment freely unfolds Martin Heidegger’s dialogical approach to poetry – primarily the poems of Hölderlin, Rilke, and Trakl – with reference to the paradigms of existential history connected to nature and therefore environment. These paradigms originating from the Greek physis, and leading through the Jewish-Christian natura have long proved to be in need of an existential historical criticism in which the accomplishment of a revealing concern for initial and original possibilities is becoming increasingly unavoidable. CHAPTER IV - Ciphers, Existence and the Musicality of Making Philosophy, Or Karl Jaspers between West and East, tries to grasp and acquire mainly with the terminological and methodological instruments of the musical – primarily symphonic – thematisation, of the musical composition, Karl Jaspers’s philosophical-mental horizons. Namely those typically jaspersian tensions and impulses, which in their connections to the Encompassing and to Existence are apparently far from them – turning back (and forth) to the oriental and western metaphysics of Sound and Light. While the “philosophical problems” elevated into themes, now start to interweave into spectacle (spectaculum) and – along this – they open up as ciphers. Concomitantly they do not send us – western thinkers – beyond the World, but contrarily, they attach us to the communicative responsibility towards the world, to ourselves respectively to others. 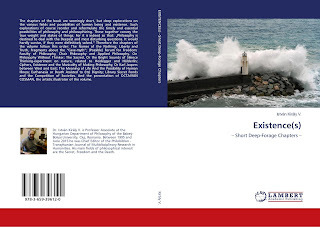 CHAPTER V - The Meaning of Life And the Possibility of Human Illness – Prolegomena, investigates philosophically the issue of human illness and its organic pertinence to the meaning of human life starting from the recognition that the dangerous encounter with the experience of illness is an unavoidable – and as such crucial – experience of the life of any living being. As for us humans, there is probably no mortal man who has never suffered of some – any! – kind of disease from his birth to the end of his life… Illness is therefore an experience or outright a danger of existence and its possibility, as well as a way of being that nobody has ever been and will ever be ontologically or existentially exempted from. So, it may well be “arbitrary” or “accidental” which disease affects which being or person, when and to what degree, in what way, etc., but it is factually unavoidable that in the course of one’s entire life – from its very beginning to its very end – one would never fall ill in some respect. The paper discusses this issue by the ontological investigation of possibility. CHAPTER VI - Euthanasia or Death Assisted to (Its) Dignity, attempts to conceptualize the “ancient” issues of human death and human mortality in connection to the timely and vital subject of euthanasia. This subject forces the meditation to actually consider those ideological, ethical, deontological, legal, and metaphysical frameworks which guide from the very beginning any kind of approach to this question. This conception – in dialogue with Heideggerian fundamental ontology and existential analytics – reveals that, on the one hand, the concepts and ethics of death are originally determined by the ontology of death, and, on the other hand, that, on this account, the question of euthanasia can only be authentically discussed in the horizon of this ontology. It is only this that may reveal to whom dying – our dying – pertains, while it also reveals our relationship to euthanasia as a determined human potentiality or final possibility. Thus euthanasia is outlined in the analysis as the possibility of becoming a mortal on the one hand, while on the other hand it appears in relation to the particularities of its existential structure, which essentially differ from the existential and ontological structure of any other possibility of dying. This is why it should not be mixed up with, or mistaken for, any of these. APPENDIX Library Secret Fonds and the Competition of Societies – is one Applied Philosophical Analysis of the competition between the Socialist / Communist social system and the capitalist social system elicited a need for secrecy. This ideological battle took place during the Cold War, which is conceptually defined as "the unarmed development of a competition between antagonistic social systems" where the goal is to "suppress" or "liquidate" the competition. This organized secrecy played a part in structuring life within each of these systems. The secret collections in Romanian libraries consisting of banned books contributed directly to this secrecy. Library secret fonds were used to control the circulation of information within a system or throughout other systems. These prohibited materials were withdrawn from circulation and kept confidential. Libraries kept lists of these fonds separate from the regular collection, and these lists were kept and up­dated throughout the years. During the Communist regime in Romania, the lists of forbidden books were considered "an efficient instrument for the political struggles from the inside of the Communist party." Library secret fonds are a symbol of the antagonism between the two political systems of the Cold War. And finally, the Presentation of the Romanian Painter, OCTAVIAN COSMAN, the artistic illustrator of the volume. József Hajós, “Ötlések” (Ideas), in Színkép – A Romániai Magyar Szó Melléklete (Spectrum – The Supplement of the “Hungarian Word of Romania”), 28–29th June, 2003, p. A.